I didn't do this one last year and since it starts on February 1, I'm signing up today. I'll be doing both games, and will try for Level One on the Limitless Pallet (maybe more). Sign up here. I love matching books to creative themes; like a scavenger hunt at home! Some challenges particularly this year have such finely-tuned criteria; what we can include is narrow. 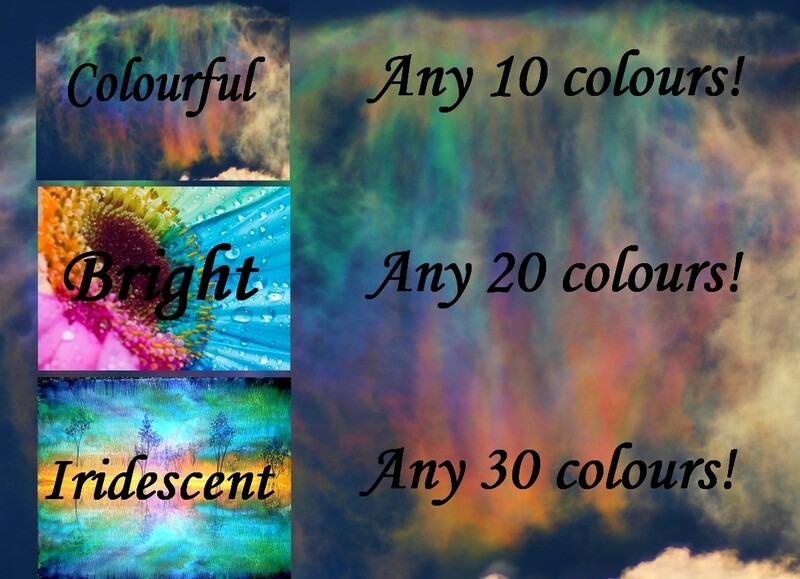 I thought about the kind of mixing & matching I would enjoy and last year, created “Gentle Spectrums”. and “Ethereal”. You have my thanks. I present broad themes, so a great deal more titles fit. It is also important to me that if we surpass a minimum quantity, those have somewhere to go. For our grande finale, a point system rewards everyone who keeps on reading & reviewing. 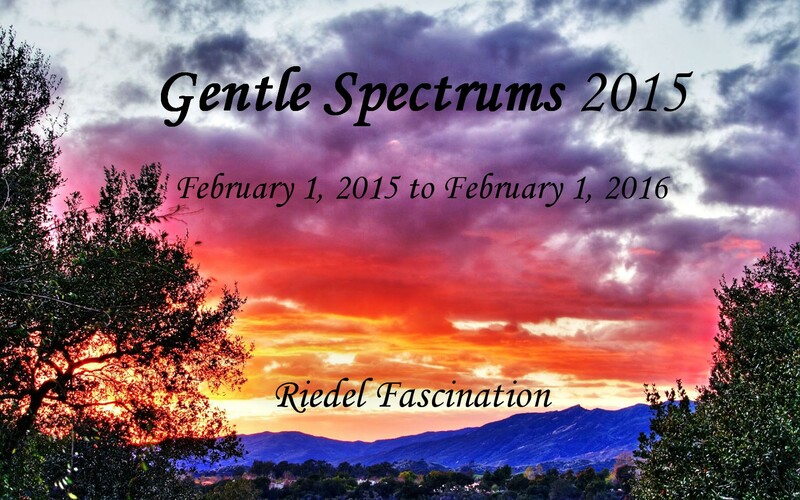 From the moment you sign-up, all Gentle Spectrums prize activities fromFebruary 2015 to February 2016, are for you! RIEDEL Fascination prizes are for all members internationally. It’s especially nice that your matieral for my categories may belong to any genre under the sun. I think of you as guests in my parlour. If you are keen on (A) or (B): here we go! :) If you decide on both; your first sign-up suffices. Surprise me with a comment that you’re doing more. Since my games are separate: if a book fits them both, go ahead and use it dually! If you blog, please give my reading challenge a post, with no more than 3 others on it. I can’t load bogged-down webpages. I also appreciate that your post gives our group visibility. Input it into the linky near the bottom of this page. If you aren’t a blogger: use any publicly-viewable forum (not ‘facebook’) that lets you make lists and write. Give our URL, tell people why you’re joining, and type in your progress. Alternatively, use the URL of your Goodreads profile page for the linky further below, or contact me with any questions. A sentence or two to explain your star rating is ample. I complile all of them in my blog’s top menu. Your reviews will be there for future browsers; no efforts wasted when our year concludes. I review at Amazon, Goodreads, and Book Depository. ~ (3) NATIONS ~Cultures, locations: lakes, towns, even well-known places; fictional included. Another one I want to do. I think this is a good idea to read about, and since I've gone through mental health services, this one seems like one for me. I'll try to read up to four books, but may do more, time permitting. Go here to sign up for this one. 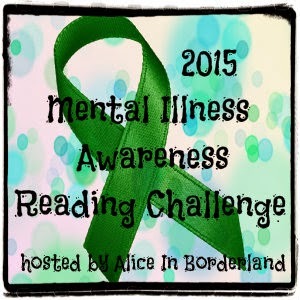 I've decided to create my own Mental Illness Awareness Reading Challenge for 2015! This is a low pressure reading challenge meaning it's about quality not quantity. I'd rather you read one or two books and get the most out of them then speed through as many books as you can. I say this for myself as well as you. I've been known to skim a section because the info seems to be a review of something I think I already know but sometimes I learn something new that I would have otherwise missed. However, this challenge isn't just for reading informative books. It's also for reading fiction and memoir. I once heard someone say the best therapy they ever received was from reading the memoirs of people who have recovered from mental illness. There is some comfort in reading about people that have experienced mental illness or have friends or family with mental illness because you know you are not alone. This reading challenge is also for those who are newly diagnosed or have friends or family that have been recently diagnosed and want to learn more about a particular mental illness. What Counts as a Book About Mental Illness? When I say mental illness, I include a wide range of illnesses and disorders. Books that include but are not limited to multiple personality disorder, obsessive compulsive disorder, hoarding, sleep disorders, post traumatic stress disorder, anxiety, depression, baby blues and postnatal depression, suicide, self harm, eating disorders, asperger's and autism, mental retardation, schizophrenia, borderline personality disorder, social and narcissistic disorders, phobias, alcoholism and addiction can all be counted. When it's informative nonfiction it's easy to know if it counts towards the challenge but when it's a memoir or fictional story this gets trickier. For the book to count towards the reading challenge, there must be at least one character with a mental illness or disorder that contributes significantly to the story. This means the story could not exist without that character's mental struggles. Sometimes books you wouldn't think would be about mental illness will touch on the subject. For example, last year I read Wishin' and Hopin' by Wally Lamb. This charming Christmas story begins with a nun who has bipolar disorder having a mental breakdown and a substitute teacher coming in to replace her. I would count this book for the challenge. Some books do not always help end the stigma of mental illness. Books such as Gone Girl by Gillian Flynn or People of the Lie by M. Scott Peck can do more harm than good. I leave it up to your own discretion whether or not to read these books. I think it's good to be aware of the misinformation out there so you can correct it. If you do choose to read books like these please read a good informative book on the same mental illness as well. The reading challenge runs from Jan 1, 2015 to Dec 31, 3015. You may sign up anytime during the year to participate. Books read in part or whole before Jan 1, 2015 do not count. Books may be novels, advice, informative, medical, or memoirs. Books must be read in their entirety. If you could be so kind, please place the 2015 Mental Illness Awareness Reading Challenge banner on your blog to help spread the word. If you write a review of the book, come back here and post the link in the comments. Please choose a level. You may change levels at anytime. You may go up or down. Remember this is a low pressure challenge. NOTE: The blog for this challenge was deleted several months ago, so I will call this challenge complete as of June 14. Want to do this one now. I think it's a good one to try. Sign up here. I just now came across this challenge and want to do it now, too. I like the ones with different categories and I know a lot of these categories will overlap with those in my other challenges. Some stuff I've already read fits the categories for this one as well. Sign up at Book Riot. Whatever your preference for reading challenges, we here at the Riot enjoy the odd challenge. We’ve written before about the benefits of a reading challenge; they can stretch your reading, whether the intention is to push you to read more of your TBR, more classics, more backlist, more new releases, or just to read more. Or even if the intention is to read less. January 1st brings with it both an abundance of challenges for the new year and an abundance of resolutions. These are often connected for readers, many of whom – Rioters included – make reading resolutions. As many of us here resolve to read more diversely, in any number of ways, we thought it would be a good idea to come up with our own reading challenge for 2015 to help you stretch your reading limits. I’ve included 24 tasks, averaging out to two per month, that will hopefully inspire you to pick up books that represent experiences and places and cultures that might be different from your own. We encourage you to push yourself, to take advantage of this challenge as a way to explore topics or formats or genres that you otherwise wouldn’t try. But this isn’t a test. No one is keeping score and there are no points to post. We like books because they allow us to see the world from a new perspective, and sometimes we all need help to even know which perspectives to try out. That’s what this is – a perspective shift – but one for which you’ll only be accountable to yourself. We hope this challenge will help you not only to read more, but to Read Harder. We’ll be checking in here on the Riot periodically throughout the year, but we’ll also be talking about this challenge on social media with the hashtag #ReadHarder. Share your books, share your challenge plan, share your recommendations.